Salad is cold food, usually based around vegetables or fruits. A dressing (a sauce), croutons (cooked crispy lumps of bread), or nuts are often added. Many salads also include cheese, fish, meat, pasta or rice. Caesar salad - Caesar salad was first created by the Mexican-Italian chef, Caesar Cardini. 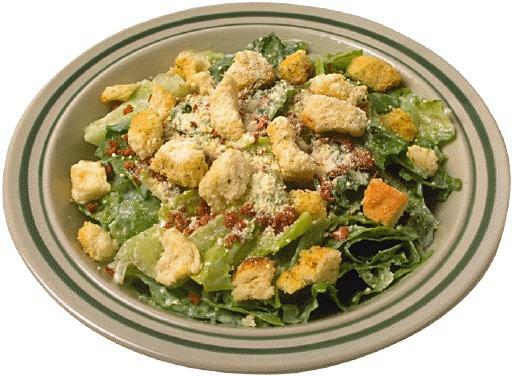 It is based on lettuce, and croutons, with a dressing of parmesan cheese, lemon juice, egg, Worcestershire sauce and black pepper. The original recipe used raw egg, but this is nowadays often omitted or substituted, because of concerns over salmonella. Additionally, modern recipes often add anchovies, breast of chicken, or capers. 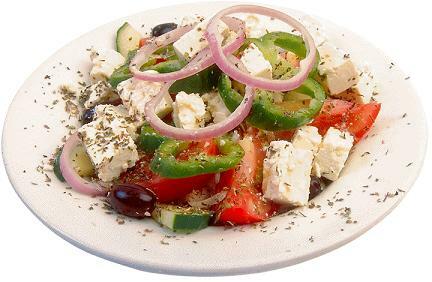 Greek salad - This is a salad based on those found in Greek cuisine and Cypriot cuisine (where it is known as "country salad" or "village salad"). It contains tomatoes, cucumber, red onions, and bell peppers, is seasoned with olive oil, red vinegar, black pepper, oregano, and salt, and often also contains feta cheese, capers, and olives. Israeli salad (known in Israel as "salat aravi") - A salad based on finely chopped tomatoes and cucumbers, often with parsley, and seasoned with lemon juice and olive oil. Poke - This is a salad from Hawaiian cuisine. It is made from cubes of raw fish, tobiko (flying fished roe), seaweed, and tofu, with assorted vegetables such as onions, scallions and tomatoes. The salad is flavored with chiles or red pepper, salt, sesame oil, and soy sauce. Waldorf salad - A salad of apple, celery and walnuts in a mayonnaise dressing. The dish is named after the Waldorf Hotel in New York city, where the salad was first created during the late 19th century.